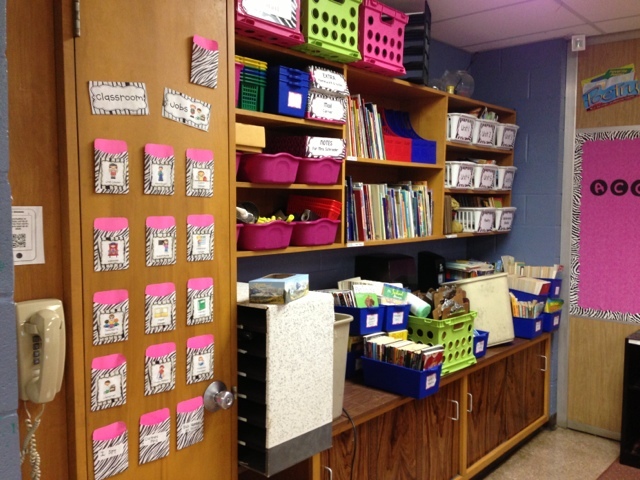 Pinkadots Elementary : Overwhelmed! Monday Made it! 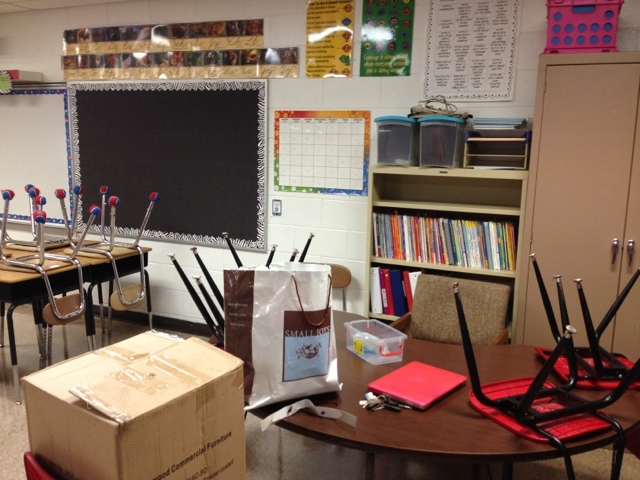 So I went to school today to check out my classroom! I wasn't going to, but Robyn guilted me into it. Plus, I knew I could grab my class list (that will probably change 100 times before the first day of school)! My husband has one more week of summer school left so the kiddos tagged along. We got dressed, ate breakfast, got dressed again because my son dumped his cereal on himself and went to leave. While carrying 100 things out the door, my husband's iPad fell on the driveway and the screen cracked up! He is going to FREAK out when he gets home! :( So I drove an angry 40 minutes to school and got into my messy classroom, that was about 90 degrees (no AC in our school). This kids tried to stay busy while I overwhelmed myself. Before long, we were all sweaty messes and needed a water break. I gave up after two hours and took the kids to lunch and then home for nap time. I will wait until I can go back to school solo before I go back. 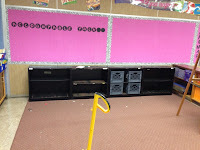 I started some bulletin boards, but don't like how uneven they are, I'm a perfectionist, and will redo them when I go back! I also started a few crafts and hung up some projects. 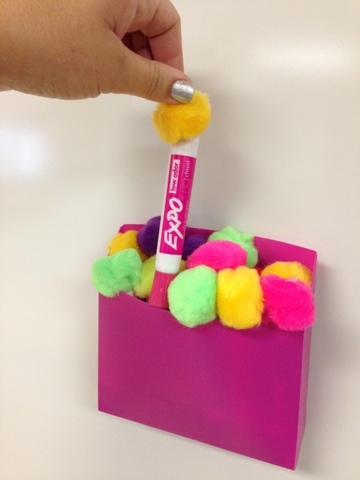 I saw a pin a while back about gluing pom poms on expo markers to use as erasers! I thought it was a great idea and tried a few... Then the bag of pom poms were confiscated by my kids, but the ones I managed to make today, should work out great. Sorry about the cheesy Monday Made it: I had a rough day! Look at my post below to see the awesome wreath I made. I have many more projects in store. I am going to tackle some clip boards this week and we will see what else! 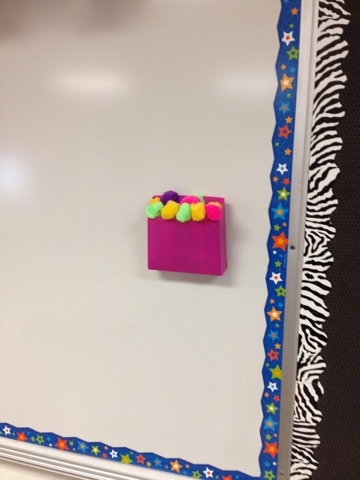 I love my magnetic boarder for my white board! My room was a mess...I grabbed the vacuum from the closet and vacuumed myself. Although we still have six weeks of summer vacation left, I feel better now that I at least started. 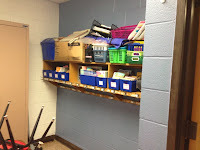 I wanted to get some laminating done...but with the heat wave and the crazy humidity, the closet is completely STUCK SHUT. This might be a problem! I have a problem. 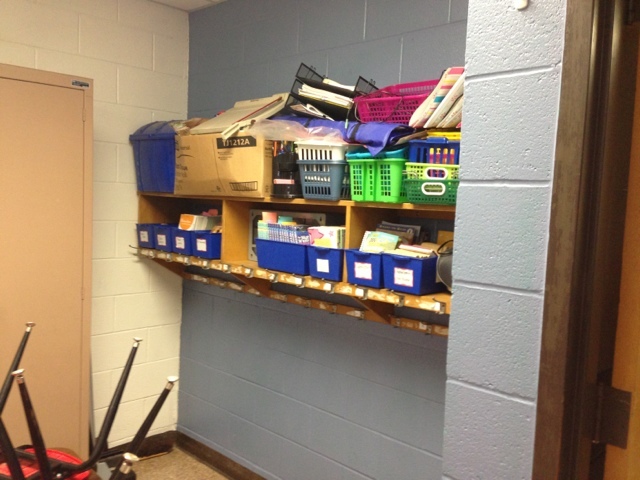 How are six bulletin boards in my classrooms not enough? I made too many cute and useful bulletin board sets for TpT. 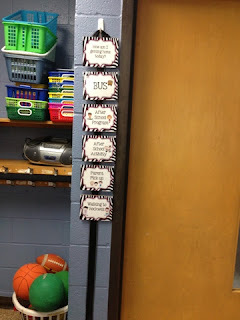 I split my accountable talk board in half to make room for our synonym board. 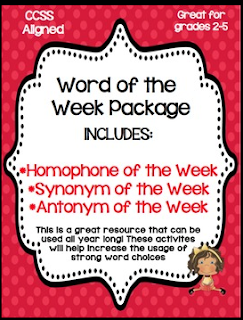 The synonym word still needs a title and the accountable talk board needs actual content. Jameson was obsessed with my Scentos markers. He had them all over his face and mouth from "smelling" them. 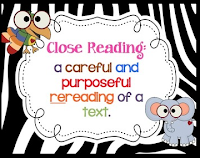 This is the close reading bulletin board set we sell in our TpT store. I made myself a special zebra print version that I AM LOVING! 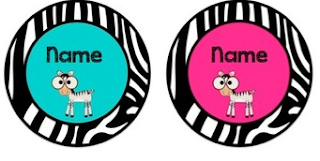 Due to so many requests and zebra lovers...this is the set I'm using. 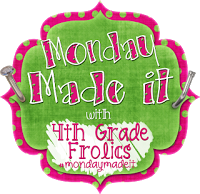 I just posted to TpT! I need to make some new clothes pins for my zebra "How am I Getting Home" list. My room is nowhere close to being done, but it will get there. I have big plans of what it will look like soon though! 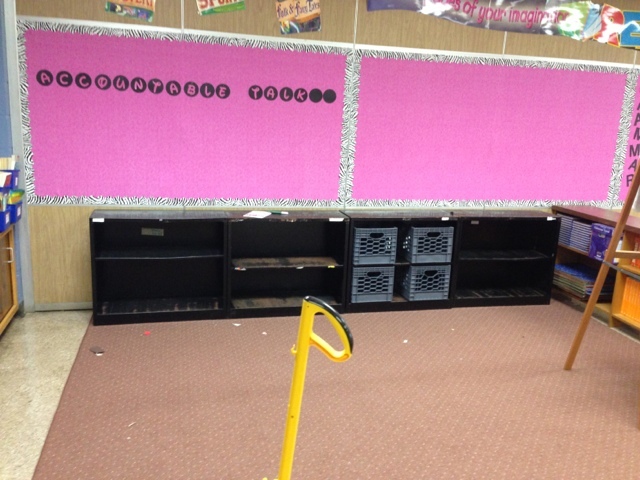 That black bulletin board is going to be my "Wild Word Wall" and I am going to put up the new 4th grade fluency word wall I created. 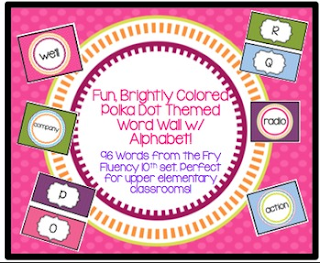 I am going to make this an editable document because although these are the 4th grade Fry words, some are ridiculously easy for a word wall. 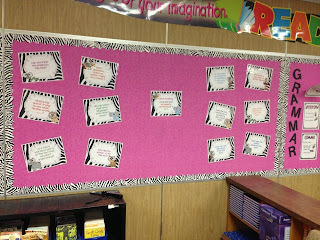 I'd like to put some more challenging words up as well and I'm sure other teachers will. Oh Goodness...I'm sorry your morning was a bit crazy. How mad will your hubby be? I have a Survivor case for that exact reason. 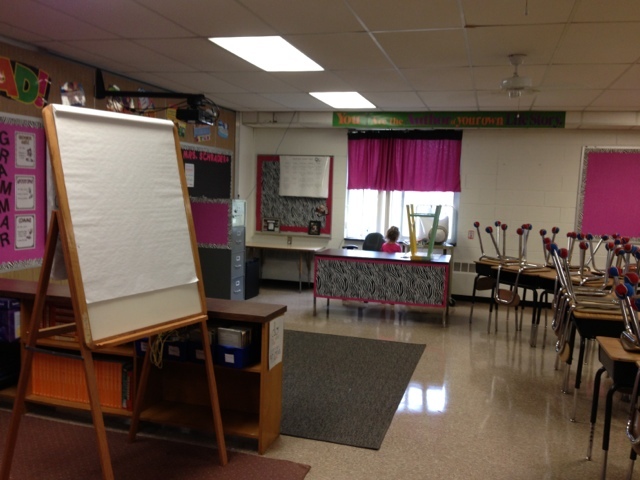 I have an adjoining classroom with another class and she gets all the air! In TX with temps in the 100's I get a little cranky! I was planning to go into my room today as well, but when I called they told me my room wasn't ready and wouldn't be ready until Thursday. 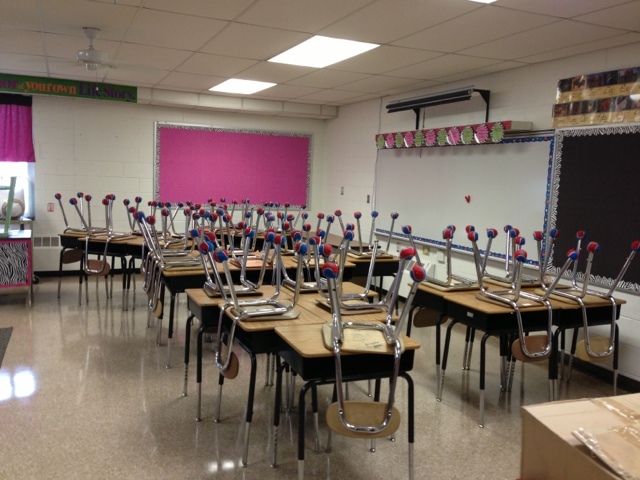 :( I am envious of all of your bulletin boards, my classroom has 0. Can't wait to see your room when it's all done. I'm wondering if anyone has any ideas on what to do with the caps for the markers during use when there is a pom pom glued to the top. I like the built in eraser idea but I fear that the kiddos will lose the caps. Pom Pom erasers!! TOO CUTE and creative! Your room is so far along already and it looks huge! 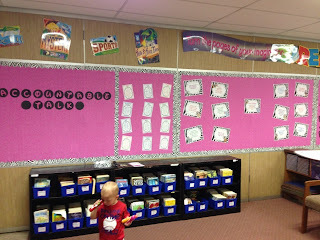 I'd be thrilled with six bulletin boards! (We never have enough room do we??!!) Sorry about your morning-I hate those kind of days! At least you got a head start! 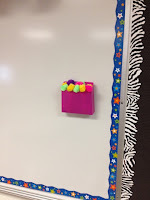 I blogged about those dry erase markers for Monday Made It two weeks ago. :O)I'm going to have my students keep their caps in the pencil tray on their desk. Your room looks great! I love the pink and black combination. Good luck braving the temperatures to finish things up. I have been putting off going in to my room because of the lack of A/C. I've been in a few times, and an hour is about all I can take, even with a fan going!